The USB-C to Dual DP Adapter is designed for connecting a USB-C embedded device (laptop, desktop and etc.) that also supports ALT mode to DP embedded device (television, monitor and etc.). If the system supports MST function, MST display output mode is available. 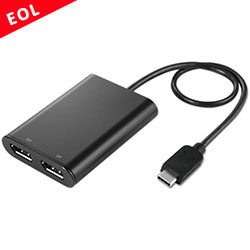 This adapter’s single DP output resolution is up to 4K@60Hz and resolution is up to 4K@30Hz when connecting with both DP ports simultaneously. No need to install extra drivers, just plug and play. 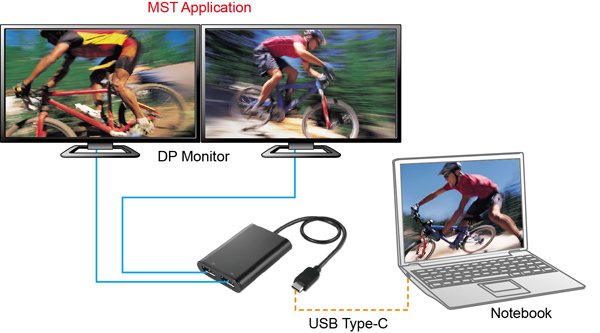 MST (Multi-Stream Transport): Output different the content to two displays when the system supports MST function.